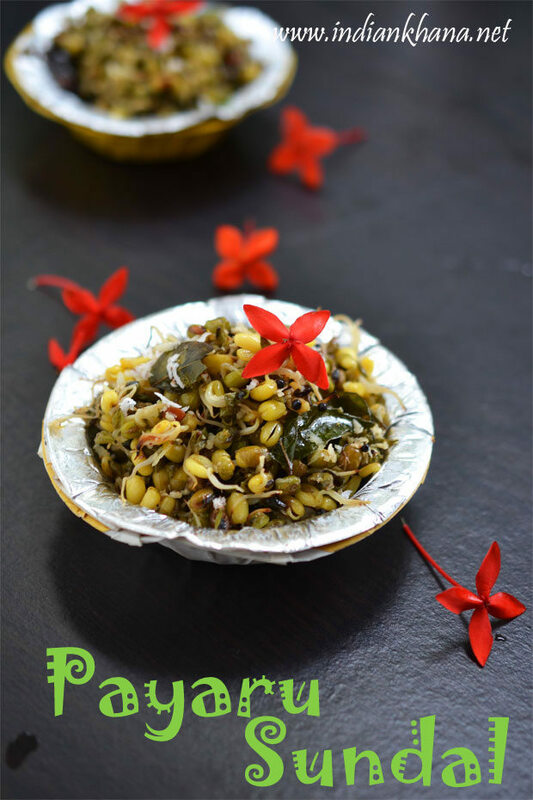 Green Gram Sprouts Sundal, Green Moong Sprouts Sundal, Sprouted Bean Sundal, Paasi Payaru Sundal and with many other names is this healthy, easy and super quick sundal recipe perfect for Navratri Naivedyam and snack. If you look for something different than the usual sundal recipes than this sprouts sundal can be great relief plus it's vegan, healthy what more to ask for? 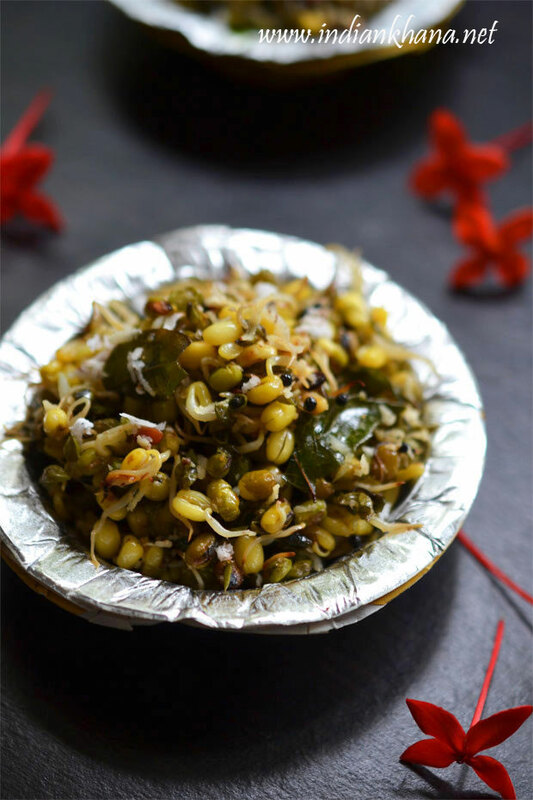 With my fresh batch of moong dal sprouts I thought of making sundal as Navratri is around and the corner, though I wanted to make this sundal in a little different way then I changed my mind and made it like normal sundal, though I added ginger which adds wonderful flavor to this delicious sundal. If you don't like ginger taste then you can skip that too. I used raw green gram sprouts but if you don't like raw sprouts then you can steam the sprouts before making sundal or cook longer while we making sundal to make the sprouts soft, I like sprouts crunchy, to have a bite so I cooked for very less time. 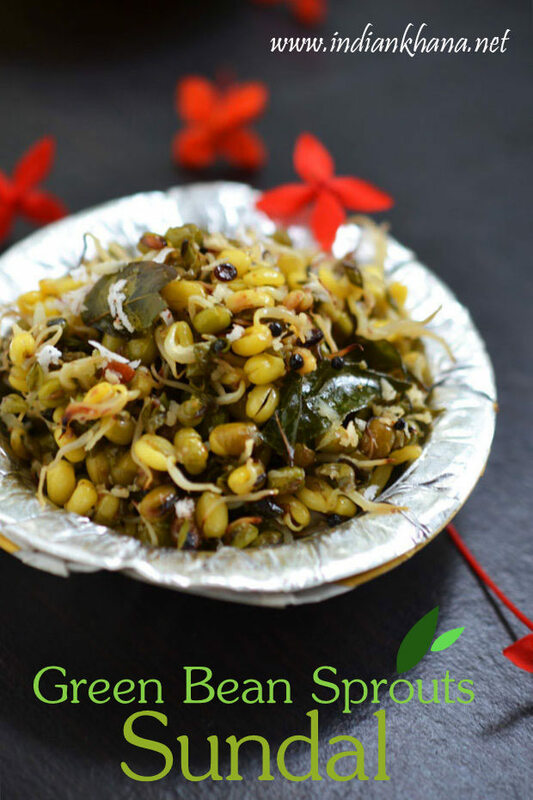 How you want the sundal is your choice but do try this healthy sundal and tell me how you liked it. Finely chop green chili, grate ginger (if using) and grate coconut (if not using grated one already), keep aside. In a pan or kadai heat oil, add hing, mustard seeds, urad dal, curry leaves, dry red chili and let mustard seeds splutters. Add ginger (if using), green chilies and saute until chili becomes light brown. Now add green gram sprouts mix everything, cover and cook for 3-4 minutes in medium to slow flame. Add salt mix everything again, cover and cook for one minute (you can cook for longer if you want to have soft sprouts sundal). Now add coconut stir well to combine and off flame. Serve for Naivedyam during Navratri and enjoy the healthy snack. If you wish you can steam sprouts first and then make the sundal, or cook longer during the process if you like to have soft and not little raw sundal or sprouts. You can 2 tsp of lemon juice to enhance the flavors further. 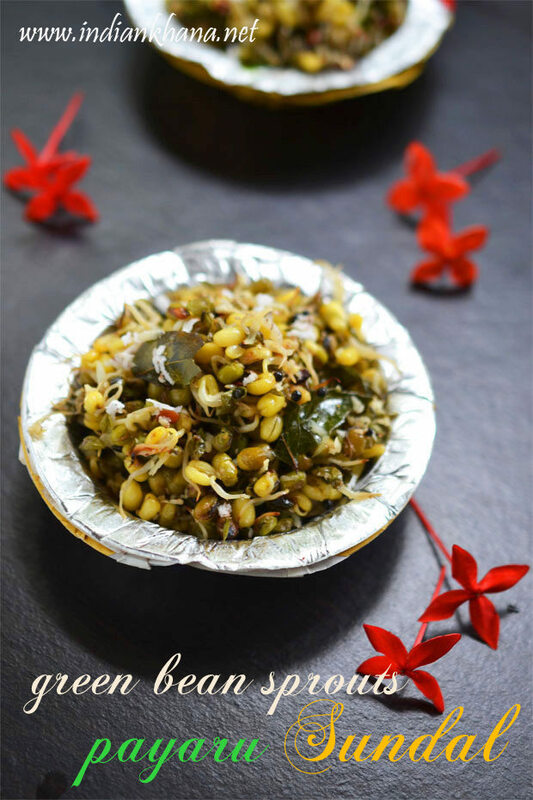 Healthy, vegan sprouts sundal for Naivedyam and great snacks to munch on.